but the the other students have been attending for 3 weeks already. So I get the beginners in English..but an extra three weeks off! Sometimes we get the question…why are you teaching? I thought you were in China to do other stuff? The answer is yes we are…but we need a visa into the country, and a resident permit that allows us to live here. Thats where the University comes in. I do enjoy teaching, and being a part of the students lives, so its not a sacrifice. You get to meet some amazing kids, and have a chance to speak into their lives. You get to spend time with kids, who are away from home for the first time, and discovering what they believe. 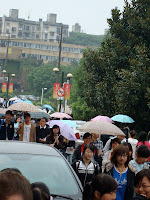 I am teaching at Hunan University of Commerce. I teach freshman Oral English, Intercultural Communication, and Lingustics. So far, the kids are great and have a good grasp on English. None of them have had a foreign teacher before, and several have told me that I am the first foreigner they have ever spoken to. I have to be careful not to develop an ego! Between my 9 classes, I have over 400 students, so it can be daunting, but I think it will be okay.